We are excited to welcome the newest member of the Missing Maps partnership: the International Federation of Red Cross and Red Crescent Societies (IFRC). For those who aren’t familiar, in informal terms, the IFRC is the umbrella organization that encompasses independent national Red Cross societies in 190 countries and helps to coordinate and support these national societies. This is a cross-post from the IFRC’s official announcement. We are pleased to announce International Federation of the Red Cross Red Crescent Societies is joining the Missing Maps Partnership. Missing Maps is an open, collaborative project in which you can help to map areas where humanitarian organisations are trying to meet the needs of vulnerable people – creating open data that can be used for planning, awareness, and analysis. Over 33,000 people have contributed 33 million edits to OpenStreetMap since Missing Maps was founded in 2014. These contributions have been used to support health interventions, emergency response, and resilience programs. Volunteers, organizations, and humanitarians collaborate in a number of ways: remote mapping, field mapping, and humanitarian activities. 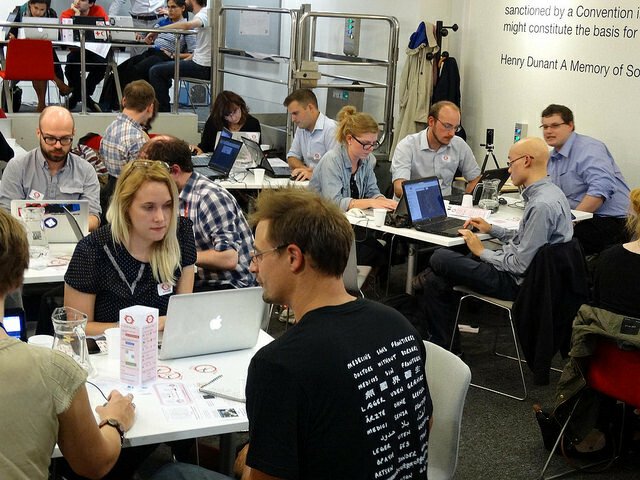 Founded by the American Red Cross, British Red Cross, Médecins Sans Frontières, and Humanitarian OpenStreetMap Team, Missing Maps connects a global community of volunteers to humanitarian response. Other Movement members also include the Netherlands Red Cross and the Canadian Red Cross. Some of the mapathon activities initiatives include mapping tasks in support of work of the International Committee of the Red Cross (ICRC), Nepal Red Cross Society, Tanzania Red Cross Society and Malawi Red Cross Society. Mapathons have been hosted by many national societies including Finnish Red Cross, German Red Cross, and Luxembourg Red Cross. As we grow this program, we anticipate more collaboration across the Movement. “Building Maps is building trust,” IFRC Under Secretary General, Jemilah Mahmood. Engaging local communities and volunteers with Missing Maps provides an opportunity to link our work to more volunteers, including youth and as well as technical audiences. There are active mapping tasks mapping tasks focused on current humanitarian needs. This includes response for Hurricane Irma, the Mexico earthquake and Bangladesh floods. Volunteering is at the heart of all that the Red Cross Red Crescent Movement activities. Hear one volunteer’s story on mapping for the Sint Maarten Hurricane Irma response. We excited to be collaborating with all the Missing Maps Partners and the wider OpenStreetMap community. Stay tuned for more activities. To get started, follow the Missing Maps blog, twitter and take a tutorial today. If you are with a Red Cross Red Crescent society and want to learn more, please do get in touch.